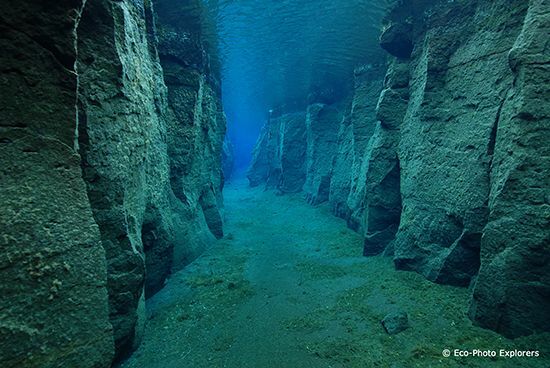 Divers explore the famous Silfra fissure. Well, it shouldn’t have been too much of a surprise. 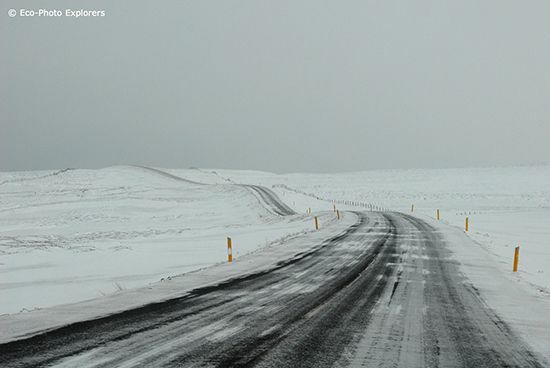 We were, after all, driving along the northern coast of Iceland at the end of winter. 50 MPH winds, blinding snow and frigid temperatures? What did we expect? The snow-covered road to Nesla. Iceland is a land of contradiction. Geologically and volcanically active, the land is scarred from recent lava flows and contorted and twisted by the spreading of the earth. Indeed, the mid-Atlantic ridge goes right through the center of Iceland, where volcanoes rise and the North American and Eurasian continental plates are ripping apart. 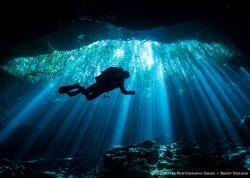 In some areas, cracks in the Earth’s crust have flooded with lava filtered glacial melt water, making for unparalleled diving opportunities in crystal clear water with almost unlimited visibility. 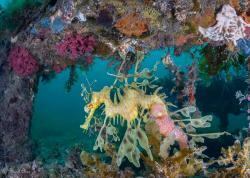 Along the coasts, myriad diving opportunities exist in and around the many fjords and divers can delight in healthy populations of marine life. Perhaps most notable is the unique and precious dive site known as Strytan, the only known collection of hydrothermal vents reachable in diveable depths. Iceland, the land of fire and ice, has much to offer. Cold water nudibranchs can be found at Strytan. 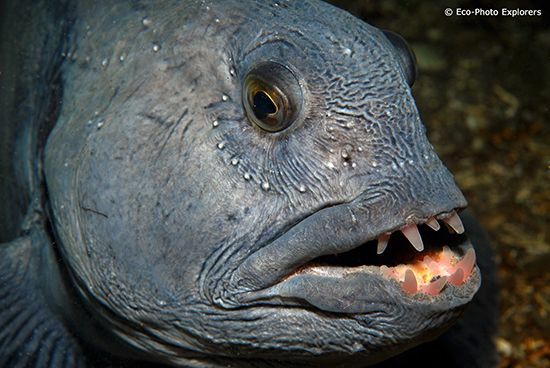 The ferocious-looking but harmless Wolf fish. The Strytan dive site viewed from our zodiac. Our dives at Nesgjá took us through a winding corridor of boulders, created through a slow but jarring ripping apart of the Earth’s crust. The water here is pure and clear. Although there is no marine life to speak of, the dramatic rock formations and crystalline water make for a truly memorable experience. We wound our way through the length of the crack, and then emerged into a lagoon of equally clear water. With depths never exceeding more than 30 feet, dive times here are limited by your air supply and your tolerance for the cold. After a dive at Nesgjá, an interesting option is to visit the nearby site known as Litla Á. Here, we dove in 63-degree (f) water, which emerges from various spots along the bottom like so many miniature geysers. 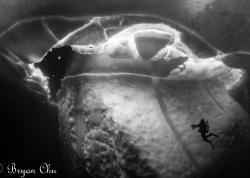 With the air temperature hovering close to 10 degrees Fahrenheit, this dive was quite comfortable! Although the water is quite shallow, never reaching more than 5 or 6 feet in depth, the warm, clear water, the unique phenomenon of hot water emerging from the bottom and the occasional encounter with the large trout that make their home here make this a worthwhile visit. In 1997, Erlendur Bogason discovered a hydrothermal vent in the dark water of the Eyla Fjord, located near to the town of Akureyri. Strytan, as this location has been named, rises from over 200 feet to nearly 50 feet below the surface. Hydrothermal vents are otherwise located many thousands of feet deep and Strytan is the shallowest known one in the world. A “White Smoker”, Strytan is a set of chimneys that emit very hot water (176 degrees Fahrenheit) and are formed by smectite, a white clay material that mixes with other crustal elements and minerals. Divers can explore the towering formations and will marvel at the marine life that abounds in these waters. 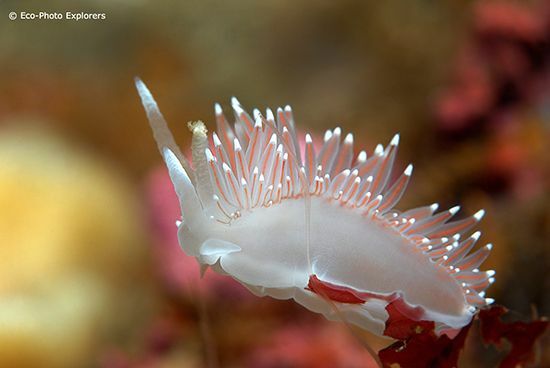 Macro enthusiasts will spot colorful nudibranchs, crustaceans, sponges, starfish and anemones. Swirling around the chimneys are schools of cod and Pollack, and sharp-eyed divers will also encounter the curious Lumpsucker fish and the ferocious looking Wolf Fish. Despite the fascinating array of marine life, however, our attention was repeatedly transfixed by the flowing hot water, which creates its own thermocline in the cold ocean water. 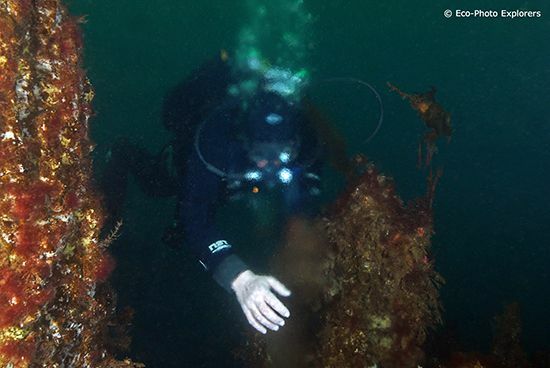 For a unique photo opportunity, divers can carefully remove their gloves and warm their hands in the hot water spewing from the vents…just be advised to not get too close! Preparing to dive a geothermal hot spring. A diver warming his hands at Strytan. Exploring the Blue Lagoon at Silfra. Two hours outside of Reykjavik is Thingvallavatn Lake, home to a ruptured landscape torn apart by geological forces. In and around the lake are many fissures and tectonic cracks, many of them filled with glacial melt water from Iceland’s second largest glacier, Langjokull. This water, filtered for 50 years through miles and miles of lava rock, emerges here as clear and clean as possible. 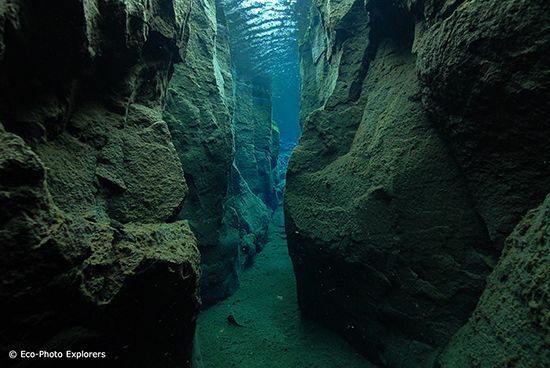 It is here that divers can visit Silfra, one of these geological cracks and one of the most iconic dive sites in all of Iceland. At Silfra, divers descend a set of stairs installed for safety and access, and then enter a labyrinth of rock walls, boulder piles, cavities and crevices all filled with some of the world’s purest water. 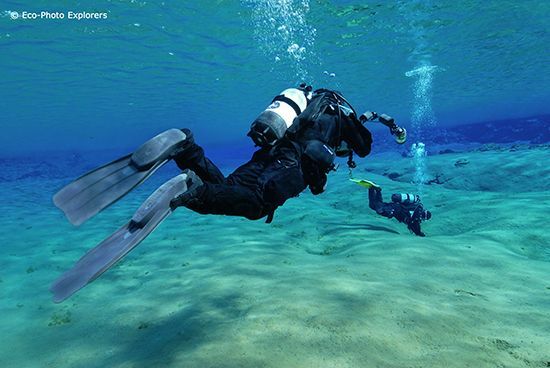 In fact, divers are encouraged to taste the water along the way! 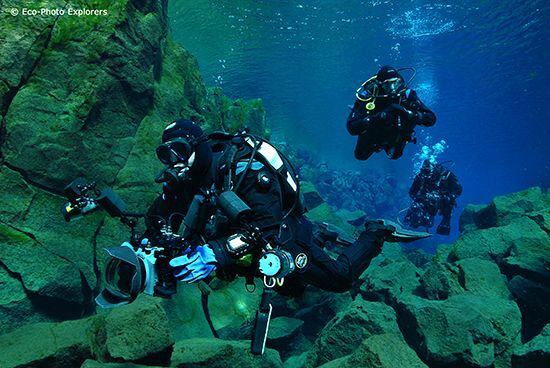 Unique to Silfra, divers can actually reach out and simultaneously touch both the North American and Eurasian tectonic plates. Diving here is akin to being transported to another world…with visibility exceeding 300 feet, temperatures hovering around 34 degrees Fahrenheit and a gentle flowing current, the dives are magical and transformative. Iceland’s diving opportunities extend to shipwrecks, cod spawning activities and the chance to dive with seabirds off the northern coast. A narrow passage at Nesla. The crystal clear water at Nesla. Topside, Iceland is an amazing contrast between civilization, history and wilderness. With only 320,000 people residing in the entire country, many of them in the main city of Reykjavik, much of the country’s landscape is natural and undisturbed. Visitors can experience black, barren fields of pumice and lava stone, breathtaking waterfalls, lovely seaside communities and dramatic mountains. Home to more than 30,000 live volcanoes, the land is relatively young and is still being formed. It is also a country steeped in history, including strong cultural ties to the Vikings, and is home to the site of the very first Parliament meeting in the year 930 AD. 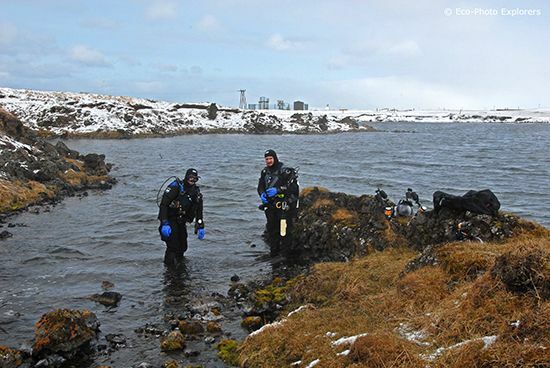 We emerged from our final dives in Iceland to the crisp, cold winter air and scrambled over the jagged rocks of Silfra, feeling exhilarated and alive. This is what Iceland does to you…it gets under your skin and injects a sense of wonder about the natural world. It creates a feeling of being part of the re birth of the Earth itself. Swimming into the cradle of geological creation is humbling, exciting and perspective shifting. Far from the maddening crowds, Iceland still retains a sense of distance and isolation. All this, and its just 5 hours from New York by air! International visitors arrive in Iceland into Keflavik Airport. Most passengers do not require a Visa to enter Iceland as long as their stay does not exceed 3 months. Transport to other regions in Iceland can be accomplished either by driving or through domestic air travel. There are domestic airports in Reykjavik, Akureyri, and several other towns. Drive time from Reykjavik to Akureyri is 4-5 hours, while air travel is 45 minutes. Baggage allowances vary for each international carrier, so check before you leave! Note: Some international carriers are now enforcing weight and size limits for carry-on bags as well what is considered a personal carry-on type of bag. Iceland lies on the edge of the Arctic and, at its northernmost point, is only 30 miles south of the Arctic Circle. Accordingly, the winters are long, generally from September to April. In the depths of the winter, daylight is almost nonexistent and in the summer the days are almost 24 hours long. However, due to the moderating influence of the Gulf Stream, winter weather in the south can be milder than in New York or Zurich. Winter is harsher in the north, with fierce storms, wind driven snow and low temperatures. Temperatures are the lowest in the Highlands. The local currency is the Icelandic Krona, but US Dollars and Euro are often accepted. DIVE.IS (www.dive.is) is a Five Star PADI Dive Center, located in Reykjavik. DIVE.IS offers a variety of multi-day tours and single day dive opportunities, along with training and equipment rental. 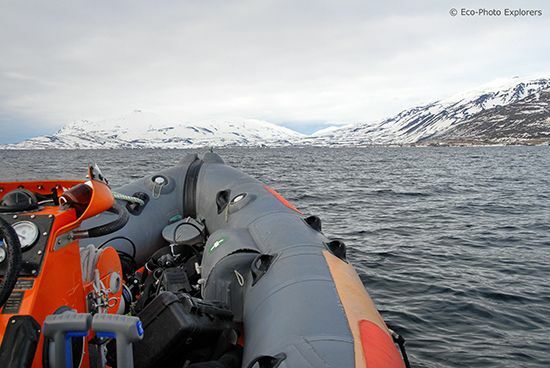 Strytan Divecenter (www.strytan.is) is located in Hjalteyri, nearby to Akureyri, and is owned and operated by Erlandur Bogason. The Skjaldarvik Guesthouse (www.skjaldarvik.is) is a good place to stay when diving Strytan. Good homemade food, with comfortable rooms. Reykjavik has a recompression chamber. 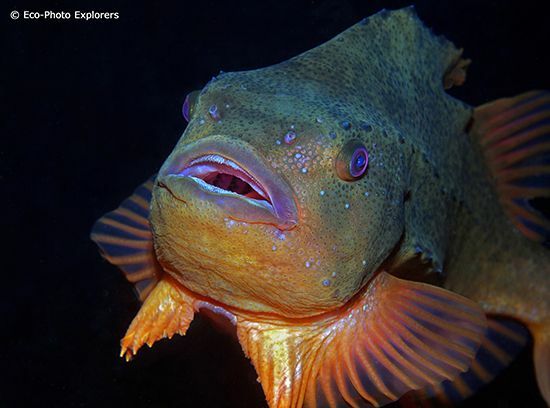 The team at Bluewater Travel can set up the perfect Iceland Dive & Underwater Photography Trip. Visit the Bluewater Travel Website. The weird-looking but colorful lumpsucker fish. 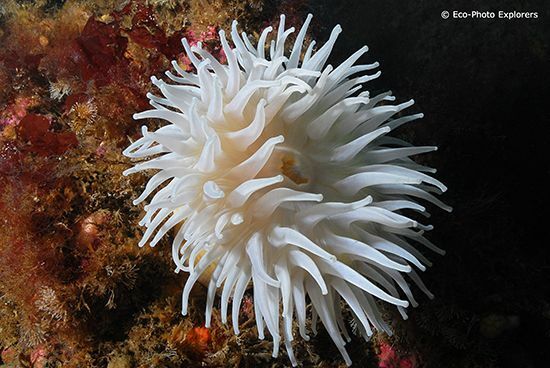 Strytan’s chimneys are covered with colorful anemones. Michael Salvarezza and Christopher Weaver have been diving the waters of the world since 1978. In that time, they have spent thousands of hours underwater and have accumulated a large and varied library of photographic images. They have presented their work in many multi-media slide presentations, and have appeared previously at some of the largest industry conferences including Beneath the Sea, the Boston Sea Rovers Underwater Clinic and Our World Underwater. In addition, they are the producers of the annual Long Island Divers Association Film Festival. Mike and Chris have been published in numerous magazines, including National Geographic Adventure, and have authored numerous articles for the majority of the dive publications the world over. Their work has also been used to support a number of research and educational programs, including the Jason Project for Education, the Atlantis Marine World Aquarium in New York and the Cambridge University and the University of Groningen Arctic Centre work on monitoring the transformation of historic features in Antarctica and Svalbard.